Mount St. Helens is a volcano in the U.S. state of Washington. It is 96 miles (154 km) south of Seattle and 53 miles (85 km) northeast of Portland, Oregon. The volcano is in Cascade Range of mountains. It is part of the Cascade Volcanic Arc in the Pacific Ring of Fire that includes over 160 active volcanos. This is a deadly volcano. Mount St. Helens was first called Louwala-Clough, which means "smoking" or "fire mountain" in the language of the Native American Klickitat people. This volcano is well known for its explosions and flows of lava. Its most famous volcanic eruption was on May 18, 1980. In 1982, U.S. President Ronald Reagan and the United States Congress made the Mount St. Helens National Volcanic Monument, a 110,000 acre (445 km²) area around the volcano that is also a part of the Gifford Pinchot National Forest. The 1980 eruption was the deadliest and most economically destructive volcanic event in the history of the United States. 57 people were killed; 250 homes, 47 bridges, 15 miles of railways, and 185 miles of highway were destroyed. A massive debris avalanche was triggered by an earthquake measuring 5.1 on the Richter scale. This caused the eruption, which reduced the height of the mountain's summit from 9,677 ft (2,950 m) to 8,365 ft (2,550 m) and replacing it with a 1 mile (1.6 km) wide horseshoe-shaped crater. The earthquake was caused by a sudden surge of magma from the Earth's mantle. The debris avalanche was up to 0.7 cubic miles (3.1 cubic kilometers) in volume. Plate tectonics of the Cascade Range. 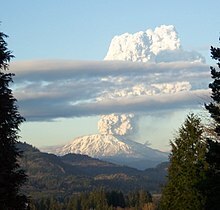 The Cascade volcanoes formed as a result of the Juan de Fuca plate subducting (moving under) the North American plate. Before the eruption in 1980, Mount St. Helens was the fifth-highest peak in Washington State. The peak rose more than 5,000 feet (1,525 m) above its base, where it rises from the ridges that are around it. It stood out from the surrounding hills because of the symmetrical cone shape and the snow that covered the top. Because of its cone-shape, it was called the "Mount Fuji of America", after the famous Mount Fuji which is a symbol of Japan. Mount St. Helens erupted on May 18, 1980, at 08:32 a.m. Pacific Daylight Time. In the months before the large eruption that took place on May 18, 1980, there were many signs of volcanic activity. On March 20, 1980, Mount St. Helens was the center of a magnitude 4.2 earthquake. Steam venting from the volcano started on March 27. By the end of April, the north side of the volcano started to grow larger. On May 18, a second earthquake of magnitude 5.1 made a huge part of the north face of the volcano collapse. It was the largest known debris avalanche in recorded history. At 8:32 a.m. Pacific Daylight Time, the magma inside of St. Helens exploded. On the Volcanic Explosivity Index scale, the eruption was rated a five, which is the same rating of the famous Vesuvius eruption in 79 AD. For more than nine hours, ash erupted from the volcano, rising into the air for 12 to 16 miles (20 to 27 km) above sea level in the air. This cloud rising from a volcano is called a "plume". The pyroclastic flow of heated rocks and gas that poured out of the Volcano spread over an area of over 230 square miles (600 km²), destroying plants and buildings. The ash spread east at about 60 miles per hour (95 km/h), with some ash reaching Idaho by about 12:00 pm, almost 3.5 hours after the eruption. By about 5:30 pm the plume of ash became smaller. Through the night and for several days after, there were smaller eruptions. As well as the effect of the fast-moving hot gasses and stones from the explosion, the collapse of the northern side of Mount St. Helens caused lahars, or volcanic mudflows. These were mixtures of volcanic ash with melted ice and snow. The lahars went many miles down the Toutle and Cowlitz rivers, destroying bridges and killing many trees. A total of 3.9 million cubic yards (3.0 million m³) of material was carried 17 miles (27 km) south into the Columbia River by the lahars. 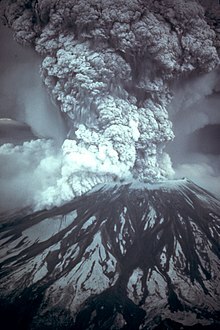 The St. Helens May 18 eruption released 24 megatons of thermal energy. It released more than 0.67 cubic miles (2.8 cubic km) of ash and other material. The collapse of the north side of the volcano shortened St. Helens' height by about 1,300 feet (400 m) and left a volcanic crater one to two miles (1.6 to 3.2 km) wide and half of a mile (800 m) deep. The eruption killed 57 people, nearly 7,000 game animals (deer, elk, and bear), and about 12 million fish from a fish farm. It destroyed or damaged over 200 homes, 185 miles (300 km) of highway and 15 miles (24 km) of railways. Between 1980 and 1986, more volcanic activity continued at Mount Saint Helens, with a new lava dome made in the crater. Several small explosions and eruptions took place, making more lava domes. From December 7, 1989 to January 6, 1990, and from November 5, 1990 to February 14, 1991, the volcano erupted with sometimes huge clouds of ash. The ash reached a number of states, as far east as Montana and as south as Colorado. The 36,000 foot plume seen on March 8, 2005. Magma bubbles came to the top of the volcano on about October 11, 2004, and a new lava dome was made on the first dome's south side. This new dome grew throughout 2005 and into 2006. Several new features were seen, such as the "whaleback," which is solid magma being pushed to the top of the volcano by magma under it. These features do not last long and break down soon after they are formed. On July 2, 2005, the tip of the whaleback broke off, and a rockfall sent ash several hundred meters into the air. 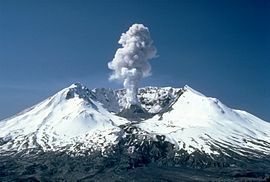 Mount St. Helens showed important new activity on March 8, 2005, when a 36,000-foot (11,000 m) plume of steam and ash came from the volcano. The plume was seen from as far away as Seattle, a city that is 96 miles away. This fairly small eruption took place because of a new lava dome being formed and a 2.5 magnitude earthquake. Another feature that grew from the dome is a "fin" or "slab." About half the size of a football field, the large volcanic rock was being moved up as fast as 6 feet (2 m) per day. In mid-June 2006, the slab had rockfalls very often, but was still being pushed up from inside the volcano. On October 22, 2006, at 3:13 p.m. PST, a magnitude 3.5 earthquake broke the lava dome. The resulting collapse and avalanche sent an ash plume 2,000 feet (610 m) over the crater, although it quickly disappeared. On December 19, 2006, a large white plume of steam was seen, and some journalists from the media thought there had been a small eruption. However, the Cascades Volcano Observatory of the United States Geological Survey says that there was no large ash plume, so it could not have been an eruption. The volcano has been erupting on occasion since October 2004. ↑ "Mount Saint Helens". Geographic Names Information System. United States Geological Survey. ↑ 7.0 7.1 "Summary of events leading up to the May 18, 1980 eruption of Mount St. Helens: March 22–28". USDA Forest Service. Retrieved 2006-10-28. ↑ Northwest NewsChannel8. "New slab growing in Mount St. Helens dome". Retrieved 2006-10-20. ↑ See close-up of the slab. Mount St. Helens National Volcanic Monument website from the U.S. Forest Service. This page was last changed on 16 January 2019, at 15:57.